Defining goals and objectives will help you know what you want your program to achieve and help you keep it on track over time. Goals and objectives also help you communicate the value of your efforts to your customers, partners, and stakeholders. Goals are one or more statements that identify what your program will accomplish over the long term (e.g., increasing the energy efficiency of homes in your community, helping residents save money on utility bills, creating jobs, improving local sustainability). Your goals may be very specific to your community’s characteristics and needs and may differ from the goals of residential energy efficiency programs in other communities. They should reflect and reinforce your organization’s vision and mission, which describe the desired future state your organization is working toward and your organization’s purpose and function. In some cases, program goals will be driven by regulation or policy, such as a utility program that complies with Public Utility Commission rules or a state program whose goals are defined by legislation or agency policy. Some programs may have goals that aim for long-term transformation of residential energy efficiency markets, while others are focused on shorter term resource procurement of energy efficiency to meet energy savings goals. Objectives are specific and measureable, include targets and timelines, and are tied to one or more goals. You should establish over-arching program objectives (e.g., “upgrade 2,000 homes in one year”) as well as establishing objectives for individual program components (e.g., “reach 50% of homeowners through marketing campaigns in the program’s first year”). These objectives will help you track progress and measure results. Additional information on setting objectives is available for Marketing and Outreach, Financing, and Contractor Engagement & Workforce Development. 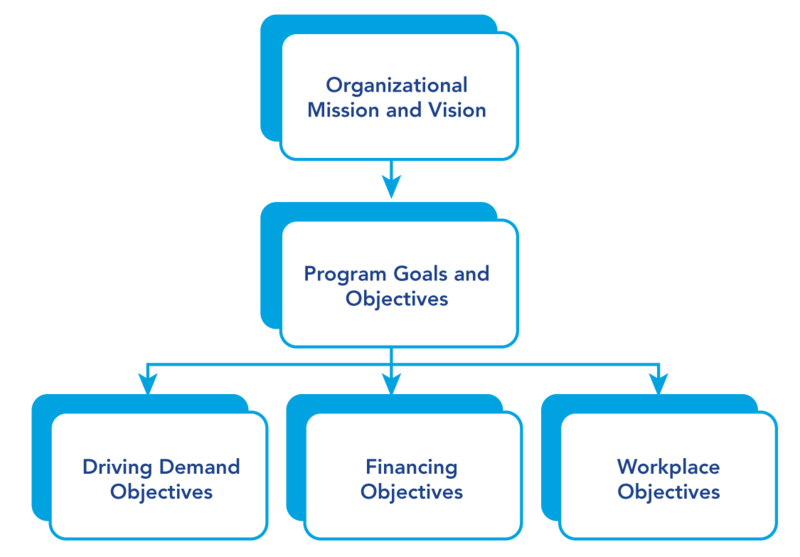 The process for using organizational mission and vision to develop program goals and then using goals to develop specific objectives for driving demand, financing, and workforce is illustrated below. Defining program goals will form the basis of your program's design, guide decisions as you refine your program over time, and help communicate what you are seeking to accomplish. Objectives based on the goals will help you choose strategies and tactics for implementing specific components of the program. Although getting input from stakeholders is listed as the last step, you should not wait until you’ve set your program’s goals and objectives to engage stakeholders. Rather, engaging stakeholders in developing goals and objectives is a good strategy for building buy-in and support. Program goals identify what your program aspires to accomplish over the long term. These goals may vary from program to program depending on community needs, organizational mission, program budget, and other factors. Most residential energy efficiency programs have goals related to saving energy and saving customers’ money. You may also want to set goals related to other aspects of your program, such as reducing peak electricity demand, creating jobs, enhancing local economic development, reducing greenhouse gas emissions, conserving water, improving health, strengthening communities, increasing community resilience, or others. Be careful not to set too many goals for a single program, because each will require specific attention and program strategies. For information on community resilience, explore the NASEO report “Resiliency through Energy Efficiency: Disaster Mitigation and Residential Rebuilding Strategies for and by State Energy Offices.” This resource describes how several state and local programs set goals to make communities more resilient to disasters and increase energy efficiency through proactive planning and program alignment. Program goals should be consistent with your organization’s vision and mission. They should be informed by your program’s market assessment, which identified the needs and opportunities in your community. Goals may also be influenced by policies that govern your program or organization. For example, state or local agencies or utilities may need to meet goals or targets set in legislation or regulation to reduce energy use, alter consumer demand patterns, reduce system-wide costs, and/or improve system reliability. Sustainable Works, a nonprofit organization in Washington State that conducted home energy assessments and upgrades had a “triple bottom line” mission that included creating quality jobs, reducing the region’s carbon footprint, and building stronger communities. The organization’s program goals were reflected in how it described its accomplishments. It didn’t just describe energy saved and assessments and upgrades conducted, it also described how many full-time jobs the work created and how many million pounds of carbon emissions were reduced annually through Sustainable Works upgrades. These results tied Sustainable Works’ goals back to its triple bottom line mission. Goals can be quantitative or qualitative, although quantitative goals are easier to measure. Either way, they should clearly articulate what success looks like for your program and community. If you are setting goals in multiple areas, you should understand how they relate to each other. For example, goals related to reducing costs to consumers may need to be balanced with goals related to quality of work and achieving high customer and contractor satisfaction. Reduce greenhouse gas emissions by a specific number of tons per year. These objectives will help you track progress. For example, the EnergySmart program in Boulder County, Colorado completed over 8,000 residential upgrades by the third quarter of 2013, exceeding its target of 6,610 homes. Over the same period, the Beacon Communities Project in New Hampshire upgraded 1,100 homes, surpassing its target of 808 homes. Tracking progress against objectives will help you understand how well the various components of your program are working together to produce results. You should also set objectives for specific program components, as discussed in the next step. Specific: What will you do? Measurable: How will you know if you have succeeded? Achievable: Why is it realistic? Relevant: How will this help you meet your program goals? Time-bounded: When will this be completed? As your program is implemented, you will want to assess progress toward your objectives to help you understand what’s working in your program and what isn’t. You can also use objectives to communicate about program progress and accomplishments. When establishing objectives, be realistic about your expectations. Objectives that are too easy to meet don’t motivate staff or stakeholders; however, an ambitious and well-publicized objective that isn’t met can harm goodwill and support. Recognize that objectives may end up changing over time as you refine your program's design and as you influence your market. In addition to setting overall program objectives, you should set objectives for each individual program component to indicate how it will contribute to program goals. You may need to make some decisions about program design before setting component-specific objectives. For example, your specific objectives about marketing and outreach may depend on the type of marketing strategies you pursue. Program design and objective-setting is an iterative process. More information on setting objectives for driving demand can be found here. Expanding the availability of financing products for all customers or certain market sectors. More information on setting objectives for financing can be found here. Help contractors expand into another line of business as a profit center, creating a stable, independent workforce apart from program delivery. More information on setting objectives for contractor engagement and workforce development can be found here. Seeking stakeholder input on your program’s goals and objectives—even as they are being developed—can help build ongoing support and buy-in for your work and potentially identify program partners that can help you administer and deliver your program. Companies that employ a large segment of the community. In addition to engaging with stakeholders that support your program, also talk to those who may not support it. For example, talk to low-cost insulation contractors that may compete with your program’s building performance contractors to understand your program’s competitive environment. Seattle’s Community Power Works (CPW) engaged more than 40 public, private, and nonprofit partners during early program design. The effort drew on Seattle's large network of "green" and energy-related organizations. As part of a key program effort, CPW engaged stakeholders to establish a High Road Agreement governing contractor and workforce goals and policies for the program (e.g., to target job creation for low-income home professionals and assist women-owned and minority-owned businesses). The relationships established in developing the High Road Agreement helped the program maintain its partners’ support as it made difficult decisions about balancing its multiple goals. For example, when considering options to boost the number of upgrades, the program had to decide whether to continue to focus on low income neighborhoods in the city (the original program focus), where there was less demand and therefore fewer jobs created, or expand demand by broadening the program to higher income neighborhoods in the city, which also increased the program’s ability to create jobs. With the support of stakeholders, the city chose to expand the program to other city neighborhoods. Source: High Road Agreements: A Best Practice Brief, Green for All, 2012.